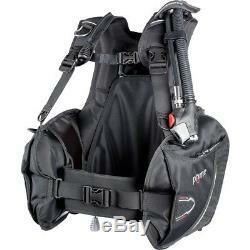 Mares Prime Scuba Diving BCD with MRS Plus Weight Pockets. Mares Prime SMU BCD, LP Inflator Hose and Owner's Manual. The Mares Prime, comfort and style in a BCD that will amaze you, standard BCD with MRS Plus Mechanical Release System for Integrated Weights. The Prime BCD provides stowage for your octopus regulator and gauges, with roomy zippered pockets and 1-aluminum and 2-heavy-duty techno-polymer D-rings for accessory storage & attachment. The Prime's air cell is made from durable Cordura 420 nylon with a polyurethane laminated interior. The BCD has a rigid backpack system with handle. Prime is ideal for people who want to get started with their diving adventure. The Prime is a Jacket Style BCD providing ample Lift with 31.3 lbs. (14.2 to 24 kg) of buoyancy in its size range. Shoulder straps, adjustable chest strap and a waist strap are all equipped with squeeze-style side-release buckles that along with the adjustable cummerbund provide a custom fit and ease of donning/doffing. Buoyancy control is established with the Ergo inflator and two rear quick-dump/over-pressure relief valves. The Ergo Inflator has been designed according to ergonomic guidelines. Intuitive to use and offers maximum grip, the Ergo Inflator comes standard with a 3/8 threaded low pressure quick-disconnect hose. The MRS-Plus Weight System 13 lbs. (6 kg) Mechanical Release System in medium, large and X-large and 8.82 lbs. (4 kg) in X-small and small. A single outward pull on the oversized handle releases the weights. If you don't need to use the maximum weight load each pocket has hook and loop dividers to eliminate weight shifting adding stability to your dive. The Prime weighs 6.8 lbs. (3.1 kg), and comes with an owner's manual. Mares Prime BCD with MRS Plus Weight Pockets. Comfort and Style in an Amazing BCD. Stowage for Octopus Regulator and Pressure Gauge. 1-Aluminum and 2-Heavy-Duty Techno-Polymer D-Rings for Accessory Attachment. Air Cell: Durable Cordura 420 Nylon with a Polyurethane Laminated Interior. Rigid Backpack System with Handle. (14.2 to 24 kg) of Buoyancy (Size Dependent). Waist Strap with Adjustable Cummerbund. All Straps Equipped with Squeeze-Style Side Quick-Release Buckles. Ease of Donning & Doffing. Buoyancy Control: Ergo Inflator and 2 Rear Quick-Dump/Over-Pressure Relief Valves. Ergo: Standard Inflation/Deflation Control Unit on Mares BCD's. 3/8 Threaded Low Pressure Quick-Disconnect Hose. MRS-Plus Weight System : Mechanical Release System (MRS) Medium, Large and X-Large 13 lbs. (6 kg) Capacity Each Pocket X-Small and Small 8.82 lbs. (4 kg) Capacity Each Pocket. (14.2 kg), SM: 33.7 lbs. (15.3 kg), Mad: 35.9 lbs. (16.3 kg), LG: 45.1 lbs. (20.5 kg) and XL: 52.9 lbs. Rear Dump/Over Pressure Relief/Shoulder Pull Dump. Torso Adjustable w/"Squeeze-Style" Side-Release Buckles. No, 1 Aluminum, 2 Techno-Polymer. Waist Strap w/"Squeeze-Style" Side-Release Buckle and Adjustable Cummerbund. Adjustable Sternum w/"Squeeze-Style" Side-Release Buckle. Outer Bag: 420 Cordura Denier Nylon, Inner Bag: Polyurethane Laminate. Releasable: MD, LG, X-L: 13 lbs. (6 kg) Capacity Each Pocket, X-S, SM: 8.82 lbs. Feedback is a very powerful tool. It gives sellers a reason to conduct business at the highest level of honesty & respect. Many years ago Leisure Pro was the first Internet-based divers supply company. We're still the number one store for scuba diving and snorkeling equipment. Thousands and thousands of satisfied customers swear by our service. Hours: Mon-Thu: 9:30-5:30, Friday: 9:30-12:30. Please do not request to have an item relisted if you do not see it any more. If we are able to relist, we will do so even without your request. We will not mark any package as a gift. You will get that automatically. Please wait 8 days from date we received the package for us to process your return. The item "Mares Prime Scuba Diving BCD with MRS Plus Weight Pockets" is in sale since Thursday, April 20, 2017. This item is in the category "Sporting Goods\Water Sports\SCUBA & Snorkeling\Buoyancy Compensators".